The Typhoon crashed near the Los Llanos air base, in Albacete. It was back from the military parade planned for the Hispanic Day over Madrid. 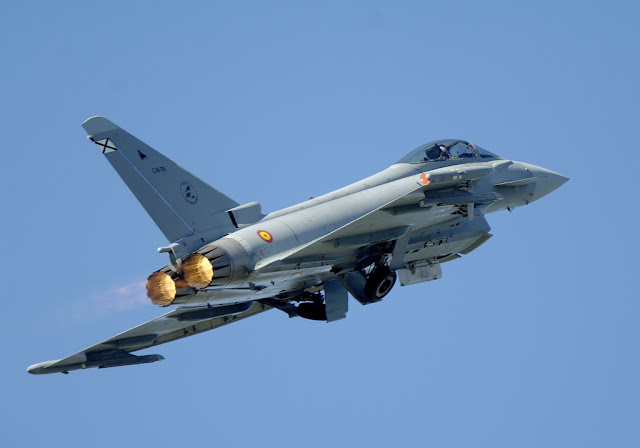 A Spanish Eurofighter Typhoon crashed at Albacete, in southeastern Spain, Oct. 12. The fighter jet was returning from the Hispanic Day parade where performed flypasts over Madrid together with other three Typhoons. The pilot Captain D. Borja Aybar did not manage to eject from the aircraft and was killed in the crash. The causes of the accident are still unknown. The crash represents the third fatal accident involving an Eurofighter in less than one month, following the death of a Saudi pilot in a Typhoon crash during a combat mission in Yemen on Sept. 13, and an accident with an Italian Typhoon during a national airshow on Sept. 24.